Set on 45 acres, this California resort and spa has on the property and is a 16-mile jaunt from the desert playground of Palm Springs. If you're looking for a great (and cheap!) hotel in Palm Springs, CheapTickets is the best place to find them. We offer deals on the best 659 hotels throughout Palm Springs. No matter what you're looking for, we have options for you. Grab great rates on the 191 affordable 3-star hotels that are easy on the wallet without sacrificing comfort. Looking for more luxury? Try one of the 111, 4-star hotel accommodations in Palm Springs. No matter your budget needs, we've pulled out all the stops to make sure you have plenty of vacation options. Maybe you prefer to search for your hotel deals based on what each hotel offers? For example, let's say you just want to find a hotel or resort that has a pool to cool off in after a long day exploring Palm Springs. Scroll down to choose from the 152 hotels in Palm Springs that has a pool for guests. Or search for deals on Palm Springs hotels offering free wifi or breakfast, non-smoking rooms, and more! CheapTickets is here to be your personal travel agent for your next trip to Palm Springs. Get booking today! What hotels in Palm Springs offer free wifi access? Are there deals on Palm Springs hotels offering free breakfast? Yes! The only thing better than finding a great deal on a cheap hotel in Palm Springs is finding one that offers free breakfast. Grab some eggs, a waffle, or some healthy oatmeal before a day full of exploring Palm Springs and all that it has to offer. Below are just some of the many hotels that offer free breakfast in Palm Springs. Best Western Plus Las Brisas Hotel is a 3.00 star rated hotel property in Palm Springs that offers free breakfast. 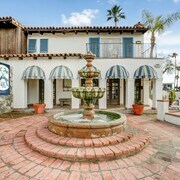 Vagabond Inn Palm Springs is a 2.00 star rated hotel property in Palm Springs that offers free breakfast. The Riviera Palm Springs- a Tribute Portfolio Resort is a 4.00 star rated hotel property in Palm Springs that offers free breakfast. Indian Wells Resort Hotel is a 3.50 star rated hotel property in Palm Springs that offers free breakfast. What about deals on pet-friendly hotels in Palm Springs? Palm Springs is a great place to get outside and explore with your pets in tow so don't leave your furry friends behind. Below you'll find great deals on hotels in Palm Springs that allow pets. Don't forget to bring plenty of treats! Fantasy Springs Resort Casino is a popular, pet-friendly, 3.50 star hotel in Palm Springs. Motel 6 Thousand Palms- CA - Palm Springs Area is a popular, pet-friendly, 2.00 star hotel in Palm Springs. 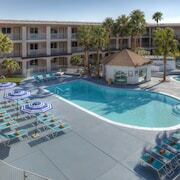 Rodeway Inn is a popular, pet-friendly, 2.00 star hotel in Palm Springs. Avalon Hotel and Bungalows Palm Springs is a popular, pet-friendly, 4.00 star hotel in Palm Springs. Any good rates on Palm Springs hotels with restaurants? Absolutely. Don't want to deal with planning our all your meals on your trip to Palm Springs? We don't blame you. Keep the hangry away by staying in one of the 58 hotels that have restaurants. With a room at one of these spots, all it takes to get a good meal is hopping in the elevator. Check out some of the most popular hotels in Palm Springs that have restaurants below. 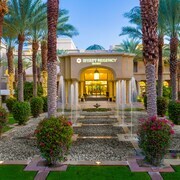 Book Marriott's Desert Springs Villas IIMarriott's Desert Springs Villas II is a 3.50 star hotel and has one or more restaurant options. 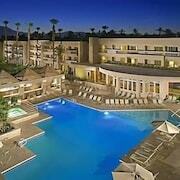 Book Hyatt Palm SpringsHyatt Palm Springs is a 4.00 star hotel and has one or more restaurant options. Book Renaissance Indian Wells Resort & SpaRenaissance Indian Wells Resort & Spa is a 4.00 star hotel and has one or more restaurant options. Book The Westin Desert Willow Villas- Palm DesertThe Westin Desert Willow Villas- Palm Desert is a 4.00 star hotel and has one or more restaurant options. What are the cheapest hotels in Palm Springs with pools? What's better after a long day exploring Palm Springs then a relaxing dip in a pool? Finding the Palm Springs hotel you need for a bargain! Cool off and unwind at one of our 152 Palm Springs hotels with a pool. Browse some of the top deals on these hotels and resorts with pools in Palm Springs below, but be warned: You may not want to check out! Motel 6 Palm Springs - Rancho Mirage has a pool and a 2.00 star rating. Hyatt Regency Indian Wells Resort & Spa has a pool and a 4.00 star rating. Indian Wells Resort Hotel has a pool and a 3.50 star rating. 7 Springs Inn & Suites has a pool and a 2.50 star rating. What hotels in Palm Springs offer parking for guests? Once you've made your way to Palm Springs, the last thing you want to deal with is finding parking close to your hotel. Avoid the hassle of parking around the block and carrying your luggage all the way to the lobby by booking one of our hotels with parking. Check out deals on some of the 142 hotels in Palm Springs that offer parking for guests. Hilton Garden Inn Palm Springs - Rancho Mirage This hotel has a 3.00-star rating. Motel 6 Palm Springs East-E Palm Canyon This hotel has a 2.00-star rating. Ace Hotel and Swim Club This hotel has a 3.50-star rating. 7 Springs Inn & Suites This hotel has a 2.50-star rating. Do Palm Springs hotels offer 24-hour concierge services? When you're on vacation, things don't always go according to plan. Travel with peace of mind when you book one of our 76 hotels in Palm Springs with 24-hour concierge service. That way you know help is always phone call or elevator ride away. Try Colony Palms Hotel. It's a 4.00 star rated hotel in Palm Springs that offers concierge services 24 hours a day. Try Caliente Tropics Hotel. It's a 2.50 star rated hotel in Palm Springs that offers concierge services 24 hours a day. 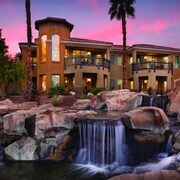 Try Marriott's Desert Springs Villas I. It's a 3.50 star rated hotel in Palm Springs that offers concierge services 24 hours a day. Try Best Western Plus Palm Desert Resort. It's a 2.50 star rated hotel in Palm Springs that offers concierge services 24 hours a day. What about low rates on non-smoking hotels in Palm Springs? Best Western Plus Palm Desert Resort This hotel has a 2.50-star rating. Motel 6 Palm Springs Downtown This hotel has a 2.00-star rating. Welk Resorts Palm Springs This hotel has a 3.50-star rating. 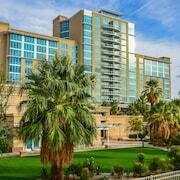 Agua Caliente Casino Resort Spa This hotel has a 4.00-star rating. What are the cheapest Palm Springs 3-star hotel deals? Our 3-star hotels bring you quality accommodations at a lower price point for the perfect, budget-friendly vacation in Palm Springs. With 191 3-star hotels throughout Palm Springs to choose from, you still have options. Browse our selection below. Indian Wells Resort Hotel. Built by Lucille Ball and Desi Arnaz as an exclusive desert getaway, this serene hotel overlooks lush fairways in the shadow of the Santa Rosa Mountains, 16 miles from downtown Palm Springs. Ace Hotel and Swim Club. Built on the foundation of a mid-century motel, Ace Hotel & Swim Club is 0.3 mile from Moorten Botanical Garden, 2 miles from the Palm Springs Art Museum, and 6 miles from the Palm Springs Aerial Tramway. Miracle Springs Resort & Spa. Situated in Desert Hot Springs, this spa hotel is 1.8 mi (2.9 km) from Desert Hot Springs Town Center and 1.9 mi (3.1 km) from Cabot's Pueblo Museum. Palm Springs Air Museum and Palm Springs Aerial Tramway are also within 12 mi (20 km). Two Bunch Palms Spa Resort - Adults Only. This Desert Hot Springs resort is nestled in the Coachella Valley, framed by rugged mountains and just minutes from downtown Palm Springs. What are the best deals on 4-Star Hotels in Palm Springs? Palm Springs is full of hotels and it can be hard to narrow down where you really want to stay. Luckily, we've done that hard work for you be narrowing you from 659 hotels throughout Palm Springs, to the 111 4-star hotels in Palm Springs. Our 4-star hotels in Palm Springs are exactly what you need for your next family trip, romantic weekend, or solo getaway. Check out our most popular deals below. Hotel Zoso: This contemporary hotel in downtown Palm Springs is steps from dining and shopping on Palm Canyon Drive, 3 blocks from the Palm Springs Convention Center, and 2 miles from the airport. Agua Caliente Casino Resort Spa: Situated in Rancho Mirage, this spa resort is within 3 mi (5 km) of Monterey Market Place, Children's Discovery Museum of the Desert, and Sunnylands Center and Gardens. Century Park and Cathedral Village Shopping Center are also within 3 mi (5 km). 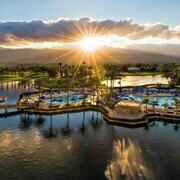 Omni Rancho Las Palmas Resort & Spa: Across the road from the River dining, shopping, and entertainment complex, this 240-acre Rancho Mirage resort is 11 miles from downtown Palm Springs. The Riviera Palm Springs- a Tribute Portfolio Resort: The Riviera Palm Springs, gives you easy access to many activities and things to do in Palm Springs, including magnificent hiking, unique jeep tours, museums and world-class shopping. 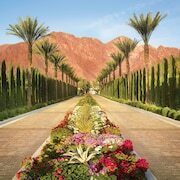 While visiting, choose from many area Palm Springs attractions and shopping malls. Play golf on several nearby championship golf courses. What are the best activities to do in Palm Springs? Palm Springs Aerial Tramway: Starting at just $26 per person. Shop & Play at Cabazon Outlets: Starting at just $25 per person. Earthquake Canyon Bicycle Tour: Starting at just $105 per person. San Andreas Fault Jeep/SUV Tour: Starting at just $169 per person.